Fresh off 2015’s acclaimed Sicario, screenwriter Taylor Sheridan returns with another well-received drama, 2016’s Hell Or High Water. The film takes us to West Texas, where we meet brothers Toby (Chris Pine) and Tanner Howard (Ben Foster). The Howard family farm falls into financial straits, so Toby and Tanner rob banks to raise the necessary funds. 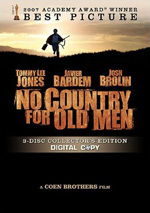 Inevitably, problems arise, and they find themselves targeted by Texas Ranger Marcus Hamilton (Jeff Bridges). Based on that synopsis, no one would expect much from Water, as the general plot can be seen as cliché and threadbare. Nothing about the film’s basic motif and themes seems creative or fresh. One look at the characters makes it hard to imagine that the film won’t wallow in clichés. Toby presents the good man pushed to crime due to economic hardship, while ex-con Toby offers the hot-headed felon who seeks out trouble. Marcus provides a cop on the verge of retirement who enjoys one last investigatory fling, and his partner Alberto Parker (Gil Birmingham) exists as little more than foil/sidekick. Despite this morass of well-worn situations and characters, Water manages to deliver an engrossing tale, largely because it rarely wallows in the clichés it threatens to embrace. I do think the movie forces its economic themes on us too heavily, and the characters tend to pontificate too much, but those trends don’t harpoon the overall project. Instead, Water provides a pretty well-rounded affair. Despite the potential to become one-dimensional, the characters manage to flourish – no mean feat given how many roles like them we’ve seen. Of the actors, Pine probably fares best of all. Bridges adds breath to his part, but I expect that, as he’s delivered a slew of fine performances over the decades. Pine comes with a less meaty résumé, so his talents give me more of a surprise – though that probably shouldn’t be the case, as 2016 demonstrates the breadth of his abilities. Water becomes Pine’s third film of the year, as it appears after The Finest Hours and Star Trek Beyond. What do those films have it common? Not much, and Pine plays three fairly different roles across them. All of these parts share a certain sense of decency, but otherwise, I find it hard to locate a lot that connects them. Without question, Toby presents the most morally questionable of the three. Bernie from Finest Hours gives us the straightest of all possible straight arrows, and Trek’s Captain Kirk always tries to “do the right thing” – in his roguish manner, of course. Toby wants to do what’s right by his family, but that impulse places him in circumstances that require him to cross various lines. Pine plays the complexity of the part and never telegraphs emotions. He neither makes Toby a rambunctious Robin Hood nor a mournful miscreant who rues everything he does. Pine gives the role a nice feeling of life and he never condescends nor forces traits. Instead, he keeps things close to the chest. Water adds a capper on Pine’s fine year and shows us that he boasts more talent than might’ve been apparent prior to 2016. And Pine helps flesh out a solid film. 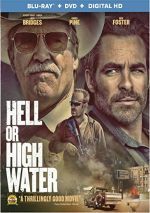 Technically, Hell Or High Water gives us a “heist thriller”, but the movie maintains a much stronger character base than that genre would imply. It takes us into its world to deliver a bright, engaging drama. Hell Or High Water appears in an aspect ratio of approximately 2.40:1 on this Blu-ray Disc. This turned into a satisfying presentation. Like most modern thrillers, this one opted for stylized hues, with an emphasis on teal and amber/orange. Within those constraints, the colors seemed fine; they showed appropriate range. Blacks were dark and full, and shadows showed good range. This was a consistently fine presentation. The DTS-HD MA 5.1 soundtrack of Water also worked well. Various action elements offered the most active use of the spectrum. This was especially true during pieces with weapons fire and fights, and a few other sequences used the channels in a satisfying way. The action scenes didn’t emerge on a frequent basis, but when they appeared, they utilized the soundscape in an engrossing manner. Music also made active use of the different channels. As we shift to extras, we find a few featurettes. Enemies Forever runs 13 minutes, 36 seconds and offers comments from screenwriter Taylor Sheridan, producers Julie Yorn and Carla Hacken, director David Mackenzie, and actors Gil Birmingham, Ben Foster, Chris Pine, and Jeff Bridges. The piece looks at story/characters, themes and inspiration. A lot of this seems perfunctory, but a few insights emerge – along with spoilers, so don’t watch “Enemies” if you’ve not already seen the film. During the nine-minute, 28-second Visualizing the Heart of America, we hear from Mackenzie, Sheridan, Yorn, Foster, Hacken, and production designer Tom Duffield. “Heart” examines sets and locations as well as design and cinematography. “Heart” offers a good look at the movie’s visual choices. Next comes Damaged Heroes. It goes for 12 minutes, 24 seconds and includes info from Yorn, Pine, Hacken, Foster, Mackenzie, Bridges, Birmingham, and actors Katy Mixon, Marin Ireland and JP Howard. “Heroes” discusses cast and performances. Some of this tends toward the usual praise, but we find a mix of useful notes along the way. A trip to the Red Carpet Premiere fills a mere one minute, 53 seconds. As expected, it shows footage from the movie’s Austin debut. It acts more like a promo than anything else. Finally, we locate a Filmmaker Q&A. It takes up 29 minutes, 51 seconds and provides a panel with Mackenzie, Bridges, Pine, Foster and Birmingham. They chat about story/characters, cast and performances, influences/inspirations, aspects of the shoot, and related areas. Filmmaker panels rarely offer more than promotional material, and this one doesn’t buck that trend. We get a few thoughtful comments but much of the piece focuses on praise. That makes it a mediocre discussion. The disc opens with ads for Blood Father, The Duel, Mechanic: Resurrection and Sicario. No trailer for Water appears here. A second disc offers a DVD copy of Water. It includes the same extras as the Blu-ray. At no point does Hell Or High Water offer a revolutionary experience, as it provides a drama that likes of which we’ve seen many times in the past. Despite its potential for cliché, the film works, as it boasts rich characters and involving situations. The Blu-ray brings good picture and audio as well as average bonus materials. Water offers a fine update on its genre.